These last two weeks have been long. Very long. Now, in terms of literal length, it wasn’t like there was some new addition of a Writday or a Painday or a Spendsallhistimeinthelibraryday. But in terms of the amount of time I spent working rather than relaxing, this week was very, very long. Now, if you’ve read my previous blogs (and this goes out to my parents… and occasionally my brother and sister), you’ll know that I spent most of my spring break working in the library. And by most of it, I mean all of it. From when I woke up, until the keyboard was still clicking between my fingers, my knees getting raspberries across the carpet, as the librarian dragged me by the heel toward the exit (you’d be surprised by what kind of muscle those women conceal behind their flabby biceps). But it has all paid off. 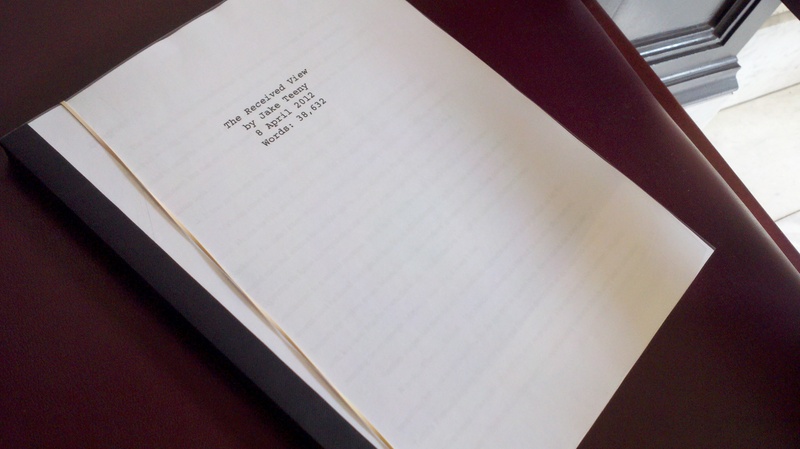 As of this morning, I completed and bound the first draft of my 38,000-word manuscript, a novella, The Received View. Now, as the 138-page document tests the structural weight-limitations of my professor’s mailbox, I will wait to have him review it, critique it, make the pages look like they were used by Dexter to cover his kill room (all of you who don’t get that reference check out…oh, never mind. My family knows what I’m talking about). And it feels good. It feels really, really good to have worked so long and so hard on a project and see it come to fruition. A lot of times we’ll start projects that we think would be awesome to complete (like my invention that transfers the dishes from the sink to the dishwasher), but often times we get too caught up in the daily grind to ever get around and actually accomplish them. But when you carve out some time, sacrifice some pleasantries, set aside the determination and patience to see something come through to it’s completion, you’ll be amazed by what you can get done. For some, just thinking about the amount of work ahead is enough to dissuade them from even attempting their goals. But as long as you admit these fears AS fears, you’ll realize the only thing stopping you is just yourself. We all have the same number of minutes in a day. It’s just a matter of what we spend those minutes on. Granted, certain things are arguably required (e.g. eating, sleeping, and—I could make a good case against this one—showering), but instead of watching TV, read that book you’ve always wanted to. Instead of playing video games, start writing that story you’ve been concocting for ages. Life is full of chances to waste time. But it’s even more full of chances to do something great. And having just completed that first draft, I can tell you I chose to do something great. Whether that greatness extends to the quality of my writing…well, I’ll just be satisfied with the fact that I got it done.